Local marketing solutions provider SIM Partners has unveiled a partnership with mobile marketing company Vibes. 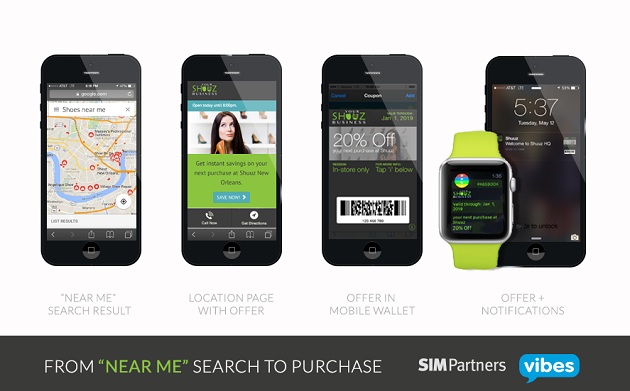 Through the partnership, SIM Partners will integrate mobile wallet campaigns, including Apple Passbook offers supported by iBeacons, with its Velocity local marketing automation platform. The partnership aims to help national brands create online and in-store offers to convert shoppers based on customers’ search intent and proximity. The partnership integrates mobile wallet offers via Vibes’ Catapult Wallet Manager, which supports Apple’s iBeacon technology, with SIM Partners’ Velocity Publishing solution. With this integration, marketers are able to drive search visibility for location pages with Velocity, as well as in-store transactions via mobile wallet offers featured on location pages. Once the offers are saved to Passbook, consumers can receive reminders when they are within 100 meters of a location based on latitude and longitude of the business. It is also important to note that iBeacons can be used for more precise notifications based on a customer’s proximity to, or position within, a location. Plus, offers downloaded to Apple Passbook can also be redeemed via Apple Watch. “We’re thrilled to be partnering with SIM Partners and bringing together two extremely effective marketing tools — location and mobile wallet technology,” said Jack Philbin, co-founder and CEO of Vibes. “SIM Partners is just one example of how Vibes’ mobile wallet APIs can give technology companies seamless and instant access to the leading mobile wallet applications in Apple’s Passbook and Google Wallet. We are seeing in-store redemption rates of 30 percent once offers are saved to Passbook and Google Wallet, so partnering with SIM Partners’ location marketing platform is a natural and smart fit for both of us and our customers." Take the following scenario as an example: if a consumer is using her mobile phone or Apple Watch to search for “drug store near me,” a national drug store chain would use Velocity to display its location information in the search results and to offer a discount coupon to be redeemed in-store via Apple Passbook or Google Wallet. Then, when the consumer is near or in the store, the retailer could offer more relevant content, such as a seasonal offer or loyalty program information to encourage repeat transactions. This partnership comes at an ideal time, as Google recently reported that the majority of its “near me” searches come from mobile devices, including 80 percent in the fourth quarter of 2014. Moreover, Vibes has run more than 400 mobile wallet campaigns with Passbook + Apple Pay and Google Wallet for several leading retailers. According to the company, the results from those campaigns shows the impact of the non-payment side of the mobile wallet as a tool for driving foot traffic, increasing average order value (AOV) and building loyalty.